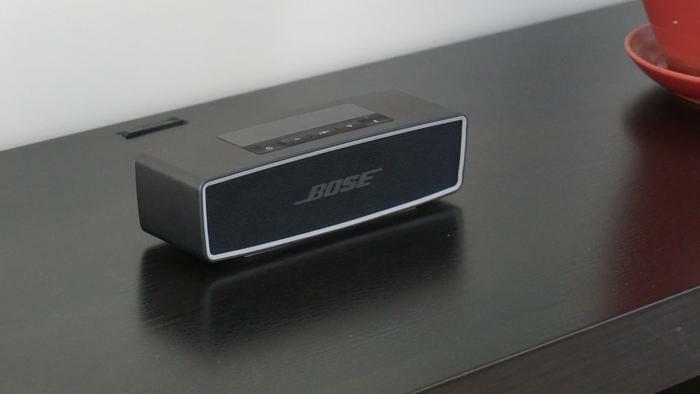 There’s a lot to like about the design of the SoundLink Mini II. Most of its body is made from an assortment of metals. The seamless enclosure is forged from anodized aluminium, while steel has been used for the perforated speaker grilles. Whatever rubber has been incorporated into the design is done tastefully, often in a contrasting colour to give the Mini II a dual-tone complexion. The Bluetooth stereo speaker is among the smallest on the market, measuring 18cm wide and weighing 670 grams. Frankly, a 600mL bottle of water has a larger footprint. Mashing together so much metal in such little space leaves it feeling solid and wonderfully dense, which is to its benefit when the volume toggle nears ‘max’. Bluetooth comes with its own advantages and disadvantages. On the one hand, it is an open standard that is borderline ubiquitous in smartphones, tablets and notebooks. On the other, songs need to be compressed and quality compromised for them to be transferred wirelessly. Connecting a smartphone with the Mini II is simple enough. Voice prompts guide through the pairing process and there’s enough storage for it to remember eight previously paired devices. Next time a previously paired device enters the speaker’s Bluetooth range, it will automatically establish a re-connection, by-passing the tedious pairing ritual and streamlining the overall experience. Two devices at a time can be paired so that music playback can be juggled between a smartphone and a tablet, for instance. Incorporating a microphone means the SoundLink Mini II can relay phone calls and double as a makeshift call conferencing system. It handles phone calls well, loudly and with clarity. Competition in the Bluetooth speaker space is heated. Yamaha, Braven and Jawbone are close rivals, all of which offer speakers that have more features for less money. Bose differentiates itself by focussing intensely on battery life and the quality of music playback. Battery life is up over the previous generation SoundLink Mini, and this is in spite of it being no bigger in size. 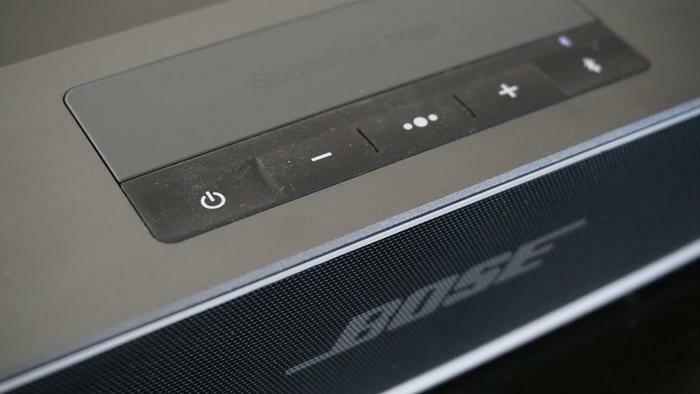 Bose claims the new model can play music for ten hours — that’s three hours more than the original. Our testing revealed the speaker could outlast our eight hour work day with some battery left in reserve. This generation speaker now works with the generic micro-USB standard. A charging dock is bundled as part of the sales kit, although we can’t figure out why; it provides no relief other than offering a different place to plug in the micro-USB charger. Underestimating this speaker comes easy on account of its low, narrow and slender profile. It will surprise with the volume of its audio, which is good enough to comfortably fill a medium sized room. Most small speakers come undone at the low-end of the sound spectrum. This one has enough bass to distill the water in a vase placed on the other end of our dining room table. The size of it does place constraints on its performance, no doubt, but unlike some rivals, its bass in not lacklustre. Working behind the scenes are a couple of transducers and a dual passive radiator. Good construction and the use of solid materials has resulted in no noticeable cabinet shake, while a rubberised base keeps the speaker’s footing steady. Tracks best suited to the speaker tend to be rhythmically slower and have fewer instruments. Some examples include the rock anthem Californication by the Red Hot Chilli Peppers, the R&B track I need a girl Part 2 by P.Diddy and the classical Primavera by Ludovico Einaudi. There are limitations brought about by its small size. The footprint doesn’t allow for much space and this is noticeable when the volume inches towards maximum. Mid- and high-frequencies encroach one another at the expense of detail and fidelity. Parts of complex tracks sound busy and cluttered, and more often than not, the speaker will fail to make a distinction between overpowering notes and those that are more subtle. This is the case with the Interstellar theme song, Final Frontier by Thomas Bergersen, Mr Brightside by The Killers and The sound of silence by Simon & Garfunkel. Lowering the volume is one way around this pet peeve, which is common in Bluetooth speakers priced less than $300. Most occasions will be better if there’s a SoundLink Mini II tagging along. 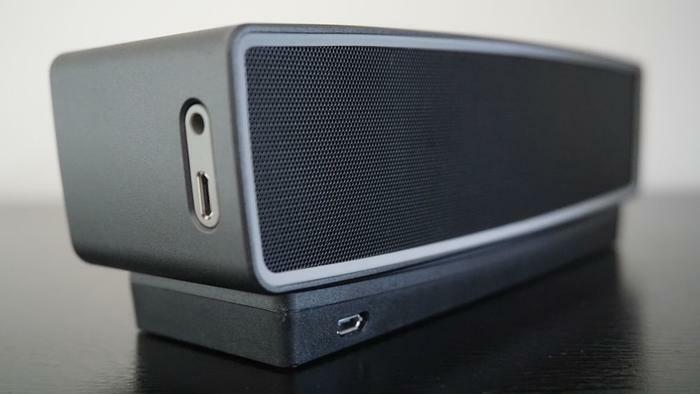 The tiny speaker packs big sound in one of the best looking bodies on the market, and better yet, the proficiency of its audio is matched by a long lasting battery. Times have changed since the original SoundLink Mini launched. Competition nowadays is more intense and, with a slew of speakers offering more features for less money, the decision to buy a SoundLink Mini II is not so clear cut. Audiophiles limited to a $300 budget will relish this speaker; those with deeper pockets should check out the gear from Bowers & Wilkins and Bang & Olufsen, which simply produce better sound. Less pedantic music listeners keen on convenience, or those who would rather spend less, will like those from Yamaha, Jawbone and Braven.